The Humility of Rates and the Arrogance of Equities - Wall St. for Main St.Wall St. for Main St. 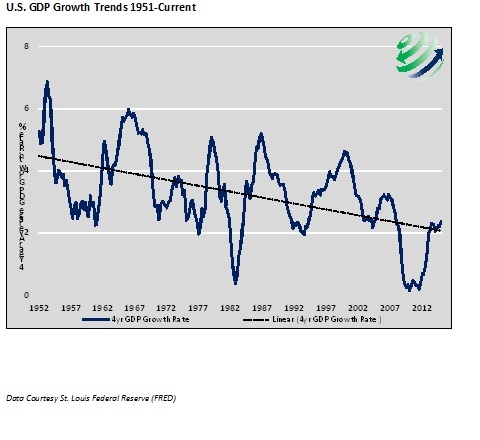 The U.S. economic growth rate has been trending lower since 1950. The current growth cycle, as illustrated in the chart above, reflects further deterioration of this trend as today’s economic growth rate is merely peaking at levels that were previously deemed recessionary (compare current growth rates with prior troughs in growth). This is troubling when one considers the unprecedented lengths to which the Federal Reserve (Fed) has gone to reverse this trend. It is not by any measure unfair to say that the monetary policy approach taken since the great recession introduces serious doubts about the efficacy of the central banks actions and leaves a lot of unanswered questions about the ultimate consequences of their actions. We are certainly better off, so the argument goes, given the measures the Fed has taken, than we otherwise would have been. The flaws in this justification are two-fold. First, it abjectly fails to consider what might have been in the longer term had we not taken the easy route or as some say “kicked the can down the road”. Second, it does not respect the risks the economy has assumed and the potential repercussions yet to manifest. Are we comfortable with unemployment data given that the participation rate sits at 38-year lows? Should the gargantuan and growing income disparity that historically has threatened the stability of so many social, economic and political systems concern us? What should we make of the massive unproductive debts our society is accumulating? Why shouldn’t we question the wisdom of a decision-making authority that has introduced and aggravated these instabilities? The United States has brushed against such imbalances in the past but has always been willing to eventually, take actions which we know to be right and proper. What appears to have evolved in the U.S. and around the world is that the practice of economic discipline has been lost, and traded for the transitory benefits of debt and quick fixes. Promoted by the intellectual glitterati of the central banks, our economic system has become addicted to all forms of debt, much of which has been unproductive. As a result the economy experiences short bursts of unsustainable economic activity instead of healthy, organic and lasting economic growth. Economic prosperity occasionally requires the sacrifice of short term gratification and progress in exchange for the promise of longer term benefits built upon that sacrifice. To the extent leadership, in whatever context, sets forth examples that are irresponsible and self-indulgent, it should not be surprising that those who take their cues from this leadership propagate this unfortunate behavior. Over time a collective mindset develops that conforms to the actions of poor leadership. Society loses its cognitive ability to differentiate between what we know historically has been wrong and what now appears to be right. Most are either unwilling or unable to discern that anything is erroneous with leadership’s decision-making and problem-solving. In 2014, all but a few argued that the path of interest rates was certainly higher. Despite a steady decline beginning on January 1st of 2014 and continuing today, everyone still insists strenuously that interest rates simply have to go up. What if all the arguments about growth in the US economy and much anticipated rate hikes by the Federal Reserve hinged upon a decision-making premise that is flawed? What if instead of the standard and variety of factors informing the consensus perspective about the direction of interest rates it is actually interest rates themselves that are sending signals that should inform our perspective about all other things? This should not be such a crazy proposal given the close relationship interest rates have had with growth and inflation in the past. Ignoring the fact that interest rates stand at levels only seen twice in American history dating back to 1790 (2012 and 1946) maybe a mistake. While the reasons are valid, the benefits of low interest rates are relatively short-lived. The dominant, lasting factor in corporate valuations, and any asset valuation for that matter, is future earnings potential. Corporate earnings are directly tied and highly correlated to the size of the economy. Historically, corporate profits have cycled in a tight band of 4% to 10% of GDP. Earnings typically reach the upper band, as they are now, when the economic cycle peaks and the lower band when it troughs. Many factors can cloud investors’ judgment, but understanding GDP growth and the cycle of profits within the economic trend is crucial. Investor sentiment tends to mirror economic cycles, oscillating between pessimism and optimism. This is typically reflective in current earnings multiples and forecasts for future earnings as well as prices. The most recent rally is no different, having progressed from outright fear to the euphoric state which pervades most domestic markets today. 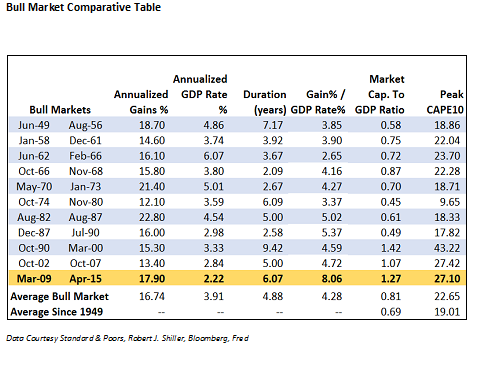 The table below compares the current bullish cycle to the ten others which have occurred since 1949. Optically today’s rally appears similar in many respects to the average rally over the last 65 years. The duration of the market move and the annual price gains are slightly higher than average but in both instances do not stand out as anomalous. Stock prices in the current rally increased much more than economic growth would typically dictate. The gain in stock prices versus the gain in GDP is almost twice the average. On a similar note the Market Capitalization to GDP ratio has reached a level that has only been attained one other time. It currently stands at 50% above the average of the prior bull markets. Excluding the 1990’s technology bubble, this is clearly unique. Cyclically adjusted price-to-earnings (CAPE 10) and other valuation methods not listed here, stands in exclusive company as well. CAPE 10 is now equal to the multiple present on the eve of the great recession in 2007 and is only surpassed by the 1990’s bubble and the 1930’s Great Depression (32.56 -not shown above). As one might expect, slow economic growth, except in the instances of very cheap valuations, has led to significant losses. The Fed, and a consensus of Wall Street economists continue to forecast “resilient” economic growth in the coming quarters. These so called “green shoots” are seemingly always getting ready to sprout. Since 2010, GDP growth projections by the Federal Reserve have been overly optimistic with GDP forecasts running 1.1% higher, on average, than actual results. Such rosy predictions require a confidence that a change in the secular economic trend is forthcoming and ignores the relationship interest rates have with economic growth and inflation. One should be circumspect of that thesis given that the predominant forces driving those secular trends have not changed, and in fact are still adding to future economic headwinds. If the expectation of “resilient” trend growth is a fallacy and interest rates continue to send signals confirming that notion as they have throughout this secular period, investor concerns should be heightened. The level and term structure of interest rates are not confirming the broad logic behind equity market valuations, they damn that logic. The same equation using low interest rates as a discount factor should also properly consider weaker earnings cash flows implied by that very same discount rate. The conclusion we draw is that the selective application of low interest rates as a key driver of currently high equity valuations is the same input that will drive equities lower revealing a risk hidden in plain sight.